When I went to SoCal a few weeks ago to visit my family, my best friend Shannan gave me this super cute heart-shaped pocket pie mold. This was the perfect gift since Valentine’s Day is just around the corner! 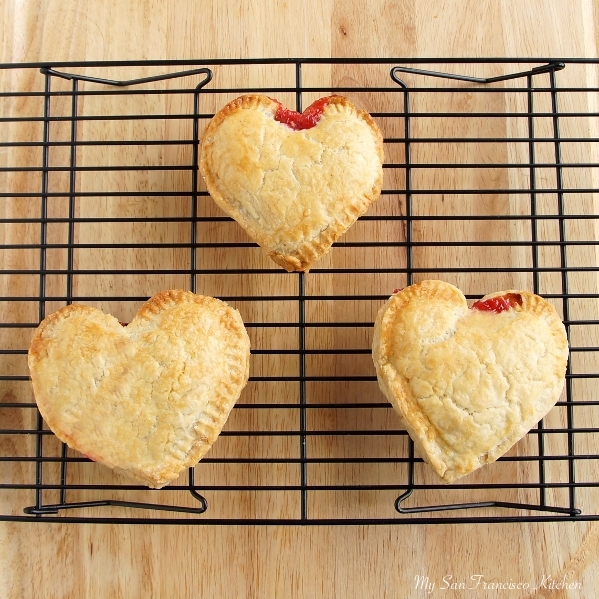 I tried it out the other day and made these delicious hand pies filled with fresh organic raspberries. 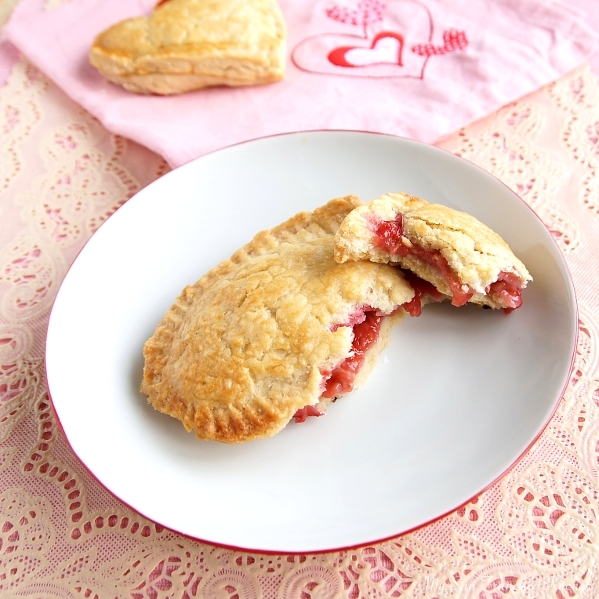 It is not only for desserts, as you can also use it to make mini calzones and other pocket pies! These raspberry-filled hand pies have a flaky, buttery crust on the outside and a tart raspberry filling (you can control how sweet you want it by adding more or less sugar before you fill them). I used my flaky pie crust recipe for the crust, which worked great. I love Valentine’s Day, because it is another one of the holidays where you get to eat all of the chocolate and baked goods you want. Everything in moderation, right? These taste great with vanilla ice cream – yum! This past weekend was so much fun! We went hiking in Marin County along the Coastal Trail, and had crystal clear views of the ocean on our left and San Francisco behind us. What a perfect day! Afterwards we were so hungry and went to a seafood place in the city. 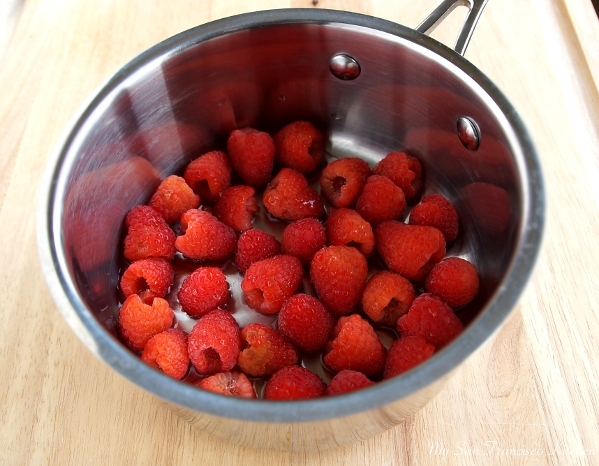 In a small saucepan over low heat, add raspberries and sugar. Stir in 1 tbsp corn starch into 2 tbsp water until dissolved. Add cornstarch mixture to the raspberries and bring to a boil. Stir a few times and remove from heat. Raspberries should be soft. Allow the raspberry mixture to cool. Taste and stir in more sugar if desired. 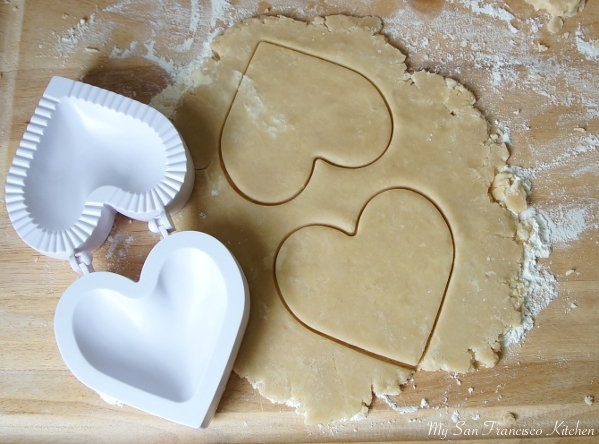 In the meantime, roll the dough out and cut 2 heart shapes with the back of the mold. Place one heart on top of each side of the mold, and press down on the filling side. 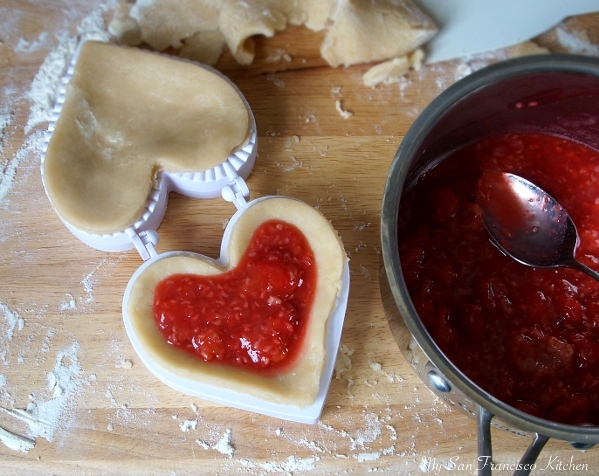 Spoon a few tablespoons of raspberry sauce into the mold, and close the mold and press firmly. Brush the tops of the hand pies with either egg white or beaten egg. Bake the hand pies for 18 minutes, or until golden brown. This entry was posted in Dessert, Organic, Valentine's Day, Vegetarian and tagged pie, raspberries. 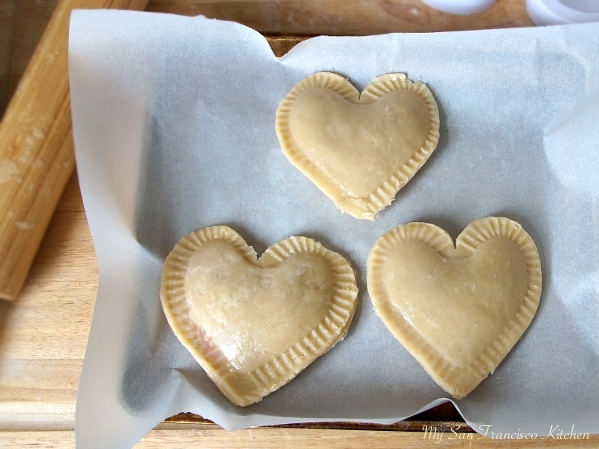 I’ve made hand pies, but your heart-shaped ones are so cute! Thank you! What kind did you make?? They totally do, now that you say that! I love that little heart contraption. And I adore raspberries!!! So nice to meet another California blogger! We are blessed to be living in Marin County now and it is such a truly beautiful place! 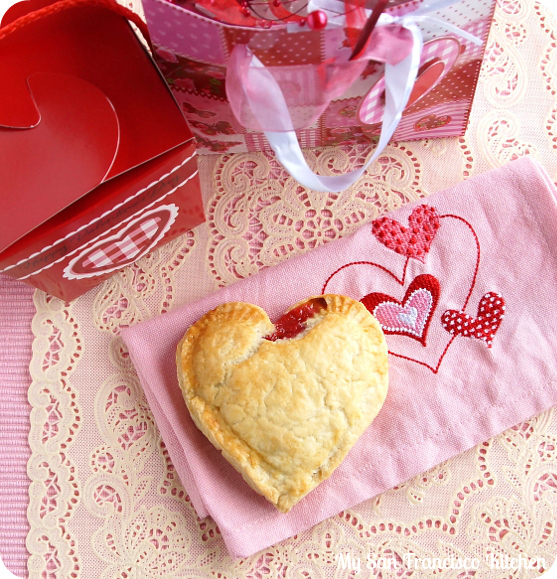 Heart shaped treats are irresistible but hand pies even more so! Cute looking pies! We always eat at home on Valentine’s Day, then go out a day or two after – much easier to get reservations! 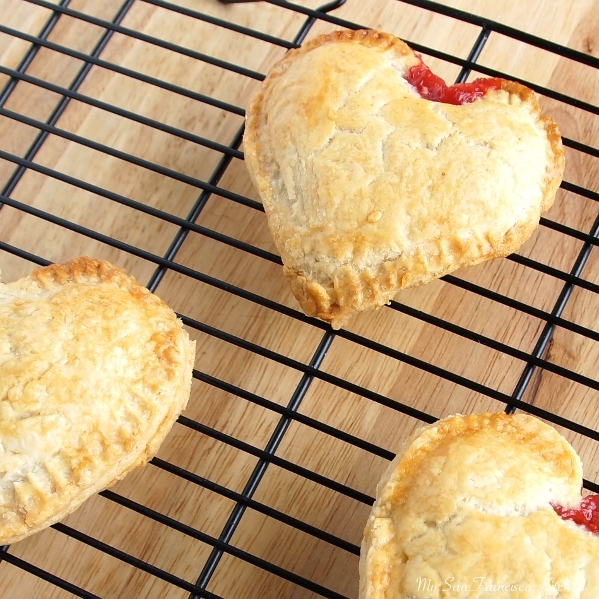 These mini hand pies look adorable and delicious! Looks like we had similar plans for a pre-vday weekend lol – J & I went hiking over in Muir Woods on Sunday. The weather was gorgeous as I’m sure you know. Any suggestions for good trails? Oh man. I’m more than a month behind with my reading! These look SO yummy and so cute! I need a little heart shaped mold like that. We stayed in for Valentine’s Day. It was pretty boring. Oh, and you two are such a cute couple! I’m so happy to have found your site and this recipe. I snagged one of the same heart molds at Target last weekend as my 5 y.o. is super excited about each and every holiday, but when I read the recipe that came with the mold I was pretty sure their “filling” may not work. Your approach makes more sense and the 3 tbs of sugar much more reasonable than the 1/3 cup for 4 pies the recipe that came with the mold suggested. Thanks very much, I hope they turn our for us just like yours. Happy V day!